For other uses, see Martyr (disambiguation). A martyr (Greek: μάρτυς, mártys, "witness"; stem μάρτυρ-, mártyr-) is someone who suffers persecution and death for advocating, renouncing, refusing to renounce, or refusing to advocate a belief or cause as demanded by an external party. This refusal to comply with the presented demands results in the punishment or execution of the martyr by the oppressor. Originally applied only to those who suffered for their religious beliefs, the term has come to be used in connection with people killed for a political cause. Most martyrs are considered holy or are respected by their followers, becoming symbols of exceptional leadership and heroism in the face of difficult circumstances. Martyrs play significant roles in religions. Similarly, martyrs have had notable effects in secular life, including such figures as Socrates, among other political and cultural examples. In its original meaning, the word martyr, meaning witness, was used in the secular sphere as well as in the New Testament of the Bible. The process of bearing witness was not intended to lead to the death of the witness, although it is known from ancient writers (e.g. Josephus) and from the New Testament that witnesses often died for their testimonies. During the early Christian centuries, the term acquired the extended meaning of believers who are called to witness for their religious belief, and on account of this witness, endures suffering or death. The term, in this later sense, entered the English language as a loanword. The death of a martyr or the value attributed to it is called martyrdom. The early Christians who first began to use the term martyr in its new sense saw Jesus as the first and greatest martyr, on account of his crucifixion. The early Christians appear to have seen Jesus as the archetypal martyr. The word martyr is used in English to describe a wide variety of people. However, the following table presents a general outline of common features present in stereotypical martyrdoms. 1. A hero A person of some renown who is devoted to a cause believed to be admirable. 2. Opposition People who oppose that cause. 3. Foreseeable risk The hero foresees action by opponents to harm him or her, because of his or her commitment to the cause. 4. Courage and Commitment The hero continues, despite knowing the risk, out of commitment to the cause. 5. Death The opponents kill the hero because of his or her commitment to the cause. 6. Audience response The hero's death is commemorated. People may label the hero explicitly as a martyr. Other people may in turn be inspired to pursue the same cause. In the Bahá'í Faith, martyrs are those who sacrifice their lives serving humanity in the name of God. However, Bahá'u'lláh, the founder of the Bahá'í Faith, discouraged the literal meaning of sacrificing one's life. Instead, he explained that martyrdom is devoting oneself to service to humanity. Martyrdom was extensively promoted by the Tongmenghui and the Kuomintang party in modern China. Revolutionaries who died fighting against the Qing dynasty in the Xinhai Revolution and throughout the Republic of China period, furthering the cause of the revolution, were recognized as martyrs. In Christianity, a martyr, in accordance with the meaning of the original Greek martys in the New Testament, is one who brings a testimony, usually written or verbal. In particular, the testimony is that of the Christian Gospel, or more generally, the Word of God. A Christian witness is a biblical witness whether or not death follows. However, over time many Christian testimonies were rejected, and the witnesses put to death, and the word martyr developed its present sense. Where death ensues, the witnesses follow the example of Jesus in offering up their lives for truth. The concept of Jesus as a martyr has recently received greater attention. Analyses of the Gospel passion narratives have led many scholars to conclude that they are martyrdom accounts in terms of genre and style. Several scholars have also concluded that Paul the Apostle understood Jesus' death as a martyrdom. In light of such conclusions, some have argued that the Christians of the first few centuries would have interpreted the crucifixion of Jesus as a martyrdom. In the context of church history, from the time of the persecution of early Christians in the Roman Empire, it developed that a martyr was one who was killed for maintaining a religious belief, knowing that this will almost certainly result in imminent death (though without intentionally seeking death). This definition of martyr is not specifically restricted to the Christian faith. Though Christianity recognizes certain Old Testament Jewish figures, like Abel and the Maccabees, as holy, and the New Testament mentions the imprisonment and beheading of John the Baptist, Jesus's possible cousin and his prophet and forerunner, the first Christian witness, after the establishment of the Christian faith (at Pentecost), to be killed for his testimony was Saint Stephen (whose name means "crown"), and those who suffer martyrdom are said to have been "crowned." From the time of Constantine, Christianity was decriminalized, and then, under Theodosius I, became the state religion, which greatly diminished persecution (although not for non-Nicene Christians). As some wondered how then they could most closely follow Christ there was a development of desert spirituality, desert monks, self-mortification, ascetics, (Paul the Hermit, St. Anthony), following Christ by separation from the world. This was a kind of white martyrdom, dying to oneself every day, as opposed to a red martyrdom, the giving of one's life in a violent death. Jan Luyken's drawing of the Anabaptist nl:Anna Utenhoven being buried alive at Vilvoorde (present-day Belgium) in 1597. In the engraving, her head is still above the ground and the Catholic priest is exhorting her to recant her faith, while the executioner stands ready to completely cover her up upon her refusal. This engraving was part of a major Protestant outrage praising Utenhoven as a martyr. In Christianity, death in sectarian persecution can be viewed as martyrdom. 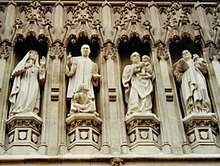 For example, there were martyrs recognised on both sides of the schism between the Roman Catholic Church and the Church of England after 1534, with two hundred and eighty Christians martyred for their faith by public burning between 1553 and 1558 by the Roman Catholic Queen Mary I in England leading to the reversion to the Church of England under Queen Elizabeth I in 1559 and then three hundred Roman Catholics martyred by the Church authorities in England over the following hundred and fifty years in the sixteenth and seventeenth centuries. Even more modern day accounts of martyrdom for Christ exist, depicted in books such as Jesus Freaks though the numbers are disputed. There are claims that the numbers of Christians killed for their faith annually are greatly exaggerated. Despite the promotion of ahimsa (non-violence) within Sanatana Dharma, and there being no concept of martyrdom, there is the belief of righteous duty (dharma), where violence is used as a last resort to resolution after all other means have failed. Examples of this are found in the Mahabharata. Upon completion of their exile, the Pandavas were refused the return of their portion of the kingdom by their cousin Duruyodhana; and following which all means of peace talks by Krishna, Vidura and Sanjaya failed. During the great war which commenced, even Arjuna was brought down with doubts, e.g., attachment, sorrow, fear. This is where Krishna instructs Arjuna how to carry out his duty as a righteous warrior and fight. Shahid originates from the Quranic Arabic word meaning "witness" and is also used to denote a martyr. The word shahid in Arabic means "witness". Shahid occurs frequently in the Quran in the generic sense "witness", but only once in the sense "martyr; one who dies for his faith"; this latter sense acquires wider use in the hadiths. Islam views a martyr as a man or woman who dies while conducting jihad, whether on or off the battlefield (see greater jihad and lesser jihad). Martyrdom in Judaism is one of the main examples of Kiddush Hashem, meaning "sanctification of God's name" through public dedication to Jewish practice. 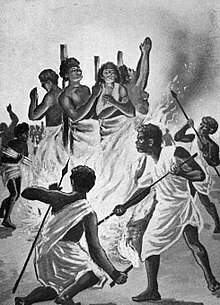 Religious martyrdom is considered one of the more significant contributions of Hellenistic Judaism to Western Civilization. 1 Maccabees and 2 Maccabees recount numerous martyrdoms suffered by Jews resisting Hellenizing (adoption of Greek ideas or customs of a Hellenistic civilization) by their Seleucid overlords, being executed for such crimes as observing the Sabbath, circumcising their boys or refusing to eat pork or meat sacrificed to foreign gods. According to W. H. C. Frend, "Judaism was itself a religion of martyrdom" and it was this "Jewish psychology of martyrdom" that inspired Christian martyrdom. Guru Arjan, the fifth leader of Sikhism. Guru ji was brutally tortured for almost 5 days before he attained shaheedi, or martyrdom. Guru Tegh Bahadur, the ninth guru of Sikhism, martyred on 11 November 1675. He is also known as Dharam Di Chadar (i.e. "the shield of Religion"), suggesting that to save Hinduism, the guru gave his life. Bhai Dayala is one of the Sikhs who was martyred at Chandni Chowk at Delhi in November 1675 due to his refusal to accept Islam. Bhai Mati Das is considered by some one of the greatest martyrs in Sikh history, martyred at Chandni Chowk at Delhi in November 1675 to save Hindu Brahmins. Bhai Sati Das is also considered by some one of the greatest martyrs in Sikh history, martyred along with Guru Teg Bahadur at Chandni Chowk at Delhi in November 1675 to save kashmiri pandits. Sahibzada Ajit Singh, Sahibzada Jujhar Singh, Sahibzada Zorawar Singh and Sahibzada Fateh Singh – the four sons of Guru Gobind Singh, the 10th Sikh guru. 399 BCE – Socrates, much of what is known about the life of Socrates has been drawn from the writings of Plato, which more often than not focus on the events surrounding the death of Socrates. Plato's writings discuss how the state charges Socrates with corrupting the youth. Socrates reached martyrdom when he chose death over escape, as in so doing he chose to die for what he believed in. This is significant in the extent to which it affected his followers and the legacy of his ideas. 1675 – Guru Tegh Bahadur, the ninth Guru of Sikhism, referred to as "Hind di Chadar" or "Shield of India" martyred in defense of religious freedom of Hindus. 1793 – Jean-Paul Marat, a French Jacobin assassinated by Charlotte Corday. 1793 – Charlotte Corday, a Girondin sympathizer executed during the French Revolution for assassinating Jean-Paul Marat. 1865 – Abraham Lincoln, 16th President of the United States. Assassinated by a Confederate sympathizer after the end of the American Civil War. 1919 – Rosa Luxemburg, a German Marxist revolutionary executed along with Karl Liebknecht for their roles in the Spartacist uprising. 1929 – Nurkhon Yuldashkhojayeva, an Uzbek dancer murdered in an honor killing for dancing without veil; depicted as a martyr of Hujum in the play "Nurkhon" by Kamil Yashin after her death. 1930 – Horst Wessel killed by Albrecht Höhler (a Communist Party member). Became Nazi martyr, due to promotion by Joseph Goebbels. 1943 – Hans and Sophie Scholl, killed during the Holocaust for distributing leaflets opposing Nazism. 1948 – Mahatma Gandhi, an Indian nationalist leader referred as the 'Father of the Nation' by Indians, assassinated by Hindu fanatic Nathuram Godse for trying to spread communal harmony. 1956 – Imre Nagy, a Hungarian communist politician. Executed for his leadership role in the Hungarian Revolution of 1956. 1961 – Patrice Lumumba, born in 1925, assassinated in Mwadingusha in Katanga, Prime minister at the time in 61. He is considered the symbol of the independence of Congo. 1963 – Medgar Evers, assassinated in 1963 for his leadership of the Civil Rights Movement in his home state Mississippi. 1965 – Malcolm X, assassinated in 1965 on account of his leadership in Black nationalism. 1966 – Sayyid Qutb, an Egyptian Islamist and a key figure in the founding of modern political Islam in the 1950s. Hung in 1966 for plotting the assassination of Egyptian president Gamal Abdel Nasser. 1967 – Che Guevara, an Argentine Marxist revolutionary. Executed for trying to foment revolution in Bolivia. 1968 – Martin Luther King Jr., assassinated in 1968 for his leadership of the Civil Rights Movement. 1977 – Steve Biko, a South African man killed for his anti-Apartheid activism. 1978 – Harvey Milk, the first openly gay city council member of a major US city (San Francisco), murdered by fellow city council member Dan White who had previously expressed prejudiced views against homosexuals. 1981 – Bobby Sands, an Irish Republican who died during a hunger strike while imprisoned. 1987 – Thomas Sankara, a Burkinabé Marxist revolutionary, deposed and assassinated for his efforts to transform the Republic of Upper Volta (which he renamed Burkina Faso) into a socialist state. 1995 – Ken Saro-Wiwa, Nigerian activist killed for speaking against the destruction of indigenous Ogoni land. 1995 – Iqbal Masih, a Pakistani child killed at age 12 for advocating against child labor. The term "revolutionary martyr" usually relates to those dying in revolutionary struggle. During the 20th century, the concept was developed in particular in the culture and propaganda of communist or socialist revolutions, although it was and is also used in relation to nationalist revolutions. In the culture of North Korea, martyrdom is a consistent theme in the ongoing revolutionary struggle, as depicted in literary works such as Sea of Blood. There is also a Revolutionary Martyrs' Cemetery in the country. In Vietnam, those who died in the independence struggle are often honoured as martyrs, or liệt sĩ in Vietnamese. Nguyễn Thái Học and schoolgirl Võ Thị Sáu are two examples. In India, the term "revolutionary martyr" is often used when referring to the world history of socialist struggle. Guru Radha Kishan was a notable Indian independence activist and communist politician known to have used this phrasing. ^ Scholars believe that Revelation was written during the period when the word for witness was gaining its meaning of martyr. Revelation describes several Christian reh with the term martyr (Rev 17:6, 12:11, 2:10-13), and describes Jesus in the same way ("Jesus Christ, the faithful witness/martyr" in Rev 1:5, and see also Rev 3:14). ^ a b A. J. Wallace and R. D. Rusk, Moral Transformation: The Original Christian Paradigm of Salvation (New Zealand: Bridgehead, 2011), pp. 217-229. ^ From A. J. Wallace and R. D. Rusk, Moral Transformation: The Original Christian Paradigm of Salvation (New Zealand: Bridgehead, 2011), pp. 218. ^ a b Winters, Jonah (1997-09-19). "Conclusion". Dying for God: Martyrdom in the Shi'i and Babi Religions. M.A. Thesis. Retrieved 2007-01-23. ^ J. W. van Henten, "Jewish Martyrdom and Jesus' Death" in Jörg Frey & Jens Schröter (eds. ), Deutungen des Todes Jesu im Neuen Testament (Tübingen: Mohr Siebeck, 2005) pp. 157 – 168. ^ Donald W. Riddle, "The Martyr Motif in the Gospel According to Mark." The Journal of Religion, IV.4 (1924), pp. 397 – 410. ^ M. E. Vines, M. E. Vines, "The 'Trial Scene' Chronotype in Mark and the Jewish Novel", in G. van Oyen and T. Shepherd (eds. ), The Trial and Death of Jesus: Essays on the Passion Narrative in Mark (Leuven: Peeters, 2006), pp. 189 – 203. ^ Sam K. Williams, Death as Saving Event: The Background and Origin of a Concept (Missoula, MT: Scholars Press for Harvard Theological Review, 1975), pp. 38 – 41. ^ David Seeley, The Noble Death (Sheffield: JSOT Press, 1990), pp. 83 – 112. ^ Stanley Stowers, A Rereading of Romans: Justice, Jews, and Gentiles (Ann Arbor: Yale University Press, 1997), p. 212f. ^ S. A. Cummins, Paul and the Crucified Christ in Antioch (Cambridge: Cambridge University Press, 2001). ^ Stephen J. Patterson, Beyond the Passion: Rethinking the Death and Life of Jesus (Minneapolis, MN: Fortress, 2004). ^ Alexander, Ruth (2013-11-12). "Are there really 100,000 new Christian martyrs every year?". BBC News. Retrieved 2014-08-22. ^ A. Ezzati (1986). The Concept Of Martyrdom In Islam. Tehran University. ^ "The Concept of Martyrdom and Sikhism" (PDF). globalsikhstudies.net. ^ Sandeep Singh Bajwa (2000-02-11). "Biographies of Great Sikh Martyrs". Sikh-history.com. Retrieved 2014-08-22. ^ "Sacrifice and Martyrdom - Gateway to Sikhism". Allaboutsikhs.com. Retrieved 2014-08-22. ^ Reeve, C.D.C. (2012). A Plato Reader: Eight Essential Dialogues. Indianapolis: Hackett Publishing Company Inc. pp. 47–59. ISBN 978-1-60384-811-4. ^ The French Revolution Page 95 Linda Frey, Marsha Frey - 2004 "He was immortalized by the painter David in the famous painting of the death scene that became the icon of the revolution and an emblem of revolutionary propaganda. The revolutionary martyr was commemorated not only in painting and in ..."
^ Revolutionary Mexico: The Coming and Process of the Mexican ... - Page 250 John Mason Hart - 1987 "They popularized Ricardo Flores Magon as a revolutionary martyr who was harassed by the American and Mexican ..."
^ Vietnam At War Mark Philip Bradley - 2009 "As the concept of 'sacrifice' (hi sinh) came to embody the state's narrative of sacred war (chien tranh than thanh), the ultimate sacrifice was considered to be death in battle as a 'revolutionary martyr' (liet si)." Bélanger, Jocelyn J., et al. "The Psychology of Martyrdom: Making the Ultimate Sacrifice in the Name of a Cause." Journal of Personality & Social Psychology 107.3 (2014): 494-515. Print. Kateb, George. "Morality and Self-Sacrifice, Martyrdom and Self-Denial." Social Research 75.2 (2008): 353-94. Print. Olivola, Christopher Y. and Eldar Shafir. "The Martyrdom Effect: When Pain and Effort Increase Prosocial Contributions." Journal of Behavioral Decision Making 26, no. 1 (2013): 91-105. PBS. "Plato and the Legacy of Socrates." PBS. https://www.pbs.org/empires/thegreeks/background/41a.html (accessed October 21, 2014). Reeve, C. D. C.. A Plato Reader: Eight Essential Dialogues. Indianapolis, IN: Hackett Pub. Co., 2012. Print. Look up martyr in Wiktionary, the free dictionary. Wikimedia Commons has media related to Martyrs. "Martyrdom from the perspective of sociology". Encyclopedia of Politics and Religion.